So I meant to post this a couple weeks ago but never got around to it. Recently my main PC’s hard drive decided to kick the bucket for good. Fortunately I had everything backed up for some time on my network drive so I didn’t lose anything critical, but a new drive was going to be required. I’d been researching Solid State Drives for awhile now and just recently they started getting under $1.00 a Gig. OCZ has been a top runner for quite awhile in terms of reviews on Tiger Direct and New Egg so I made the decision to pick one up. Seems my timing was good with Tiger Direct as this $220 drive had a $40 instant savings attached and the day after I bought it, a rebate of $30 was offered as well! 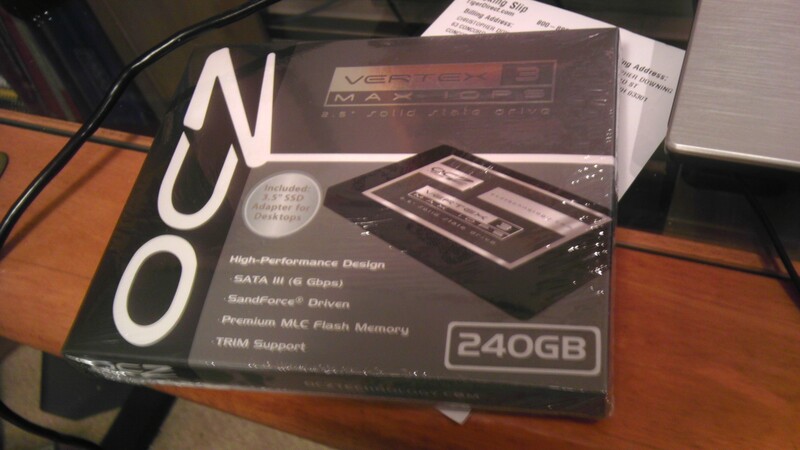 So I got this this $220 SSD for $150 bucks! I was quite happy with that! Now the drive itself was very simple to install. I had to run through a few hoops to get my OS installed correctly on it, but once that was back in play the performance increase was far better than I was expecting. My computer is actually pretty old as far as computer age goes, however at the time it was top notch. I got it back in 2008 but it was one of the first to have the new i7 Intel Quad Core technology. It also had 12 Gigs of RAM and a 512MB Radeon graphics card. I have since upgraded of course, 1GB Radeon HD6870 GPU, Creative Titanium X Sound Card and now this SSD. Though even with all these upgrades, keeping up with modern games is difficult for this first gen i7. With that said, though the general use performance increases are impressive, I’m probably not able to utilize the full power of this drive because it uses SATA 3 technology which I don’t think was around when my PC was built. But anyway, I’d recommend this drive to any who are in the market for a new one. As soon as I free up some money I’m going to upgrade my laptop as well because that one is even older (2006) and has a hard time keeping up with anything these days and I still need it to perform at a top level. But here is a link to the drive, hope you find this useful!